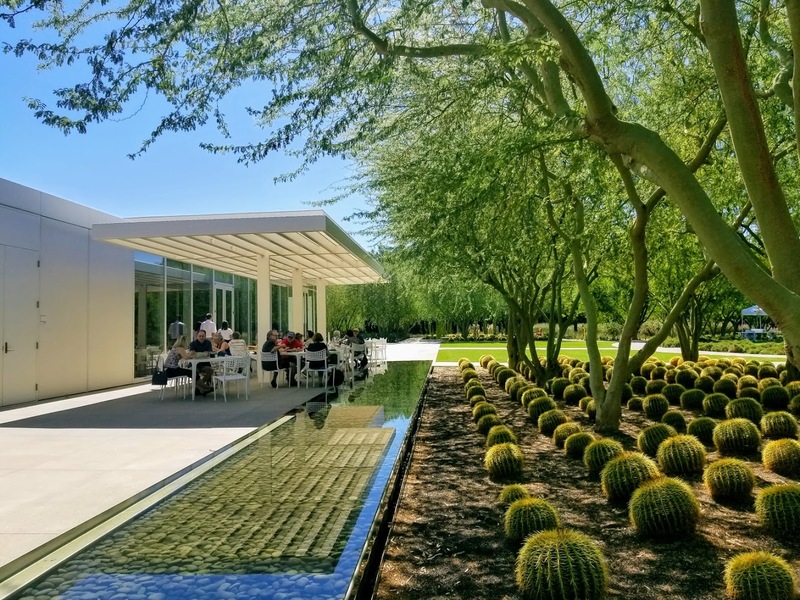 Sunnylands Café is easily one of the most beautifully designed and sited dining spots in the Coachella Valley (Palm Springs, Palm Desert, Rancho Mirage). 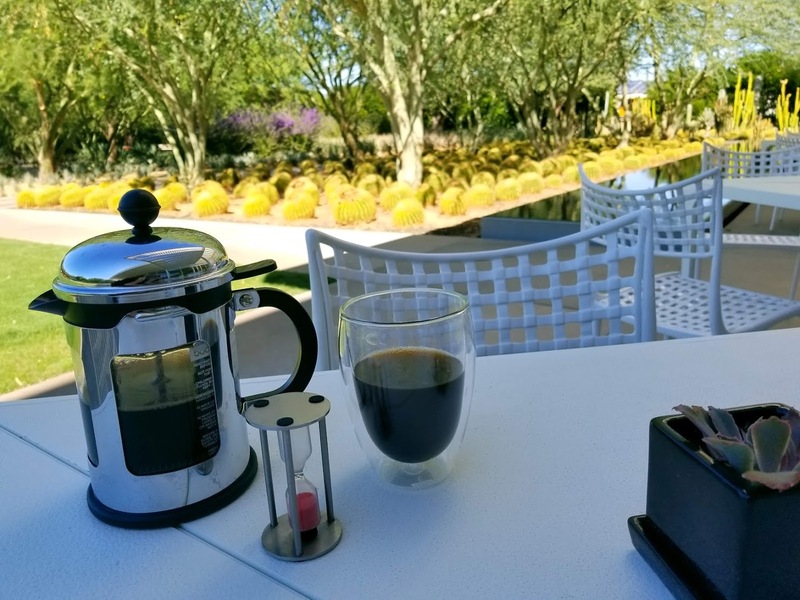 Albeit, it has limited hours to enjoy light lunches, snacks, tea, espressos, French press coffee and non-alcoholic drinks, the café is stylishly designed and located amid the Sunnylands Center and Gardens (37977 Bob Hope Drive, Rancho Mirage, CA 92270). 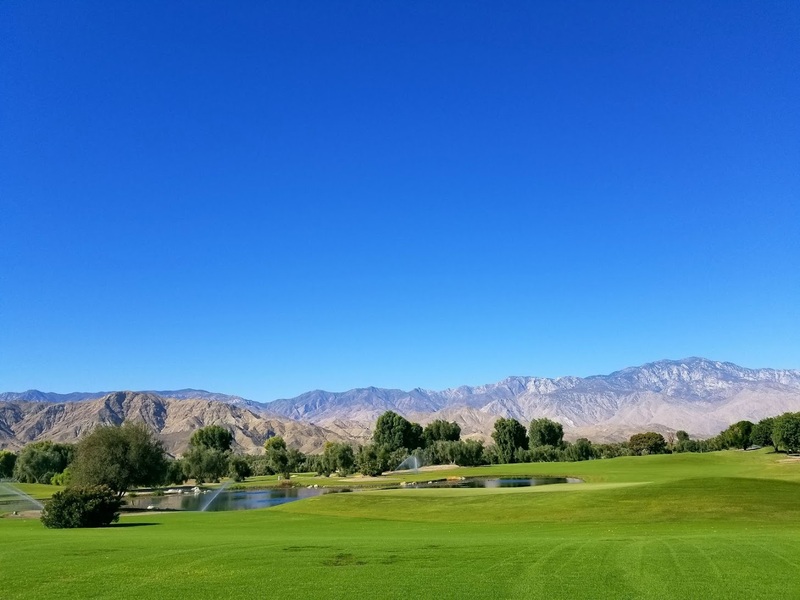 Sunnylands Café offers amazing views of the mountains from the beautiful 15-acres surrounding the haute moderne former winter home of the late Walter and Lenore Annenberg. Both were U.S. Ambassadors. More on the Annenbergs click here. While there is a long line to obtain tickets to tour the modernism estate, the nearby Sunnylands Center and Gardens are free to the public. The Café ‘s menu is brilliant in its brevity and quality. It is open for diners Wednesday thru Sunday 8 am to 4 pm. Designed by architects Frederick Fisher and Partners (in 2012), the café walls of glass blur the lines between outside and inside and the lava stone that mimick the walls in the main house. The grounds are filled with shade trees giving the patio a cool place to dine (even if you dare visit in July and August) it isn’t unbearably hot (maybe). James Burnett with horticulture consultant Mary Irish designed the gardens to reflect the Annenberg collection of Impressionist and Post Impressionist paintings (the originals are now housed at the Metropolitan Museum of Art, New York).